Ten years ago, we would have not imagined that we would be glued to our smartphones. In fact, in a recent survey, those in the 18 – 50 year old age range would rather lose their TV sets than their smartphones. “Connectivity” at all times seems to be the ethos. Be it work related or social or entertainment. How did it get to this point and where shall it go from here? Let us look at the Industrial Revolution now on its “Fourth” Reinvention since it started. The steam engine provided the power needed to run mills and even foundries. Steel production was needed to lay down the rails for trains, erect buildings, bridges and build ships. This brought in the age of mechanization. The second level is when electricity was widely used and that the “Assembly Line” was developed by Henry Ford. This also led to a redefinition on who and what are the workers, skill sets and even social levels in society. After the development of the transistor and the Integrated Circuit, the 3rd level was reached when computers were more portable and had more computing power. The internet was developed and a whole lot of interconnectivity between people revolutionized our communications and links to each other. By this, communications became instantaneous and physical distance was no longer a hindrance to social interaction but it was the world of industry and business where this was applied to the hilt.. Now, businesses need not be limited by the setting sun. A business can operate where the sun never sets and this is because of the internet. But the new technology not only brought efficiency on a global scale but also presented solutions to questions that have not even been asked. This is the 4th level or stage. The Internet of Everything. Now, information about almost everything can be found. It is not only about communicating via IP and connectivity between humans but also connectivity between machines without human intervention of interaction. This turns information into action. For example, a diagnostic machine in a hospital can be connected to Big Data and not only a diagnosis is made but also a treatment protocol that is stored in another hospital’s database will be made available in realtime. 4. The projected exponential rise in connected devices. 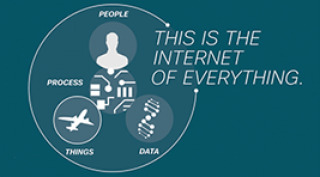 These are the benefits coming our way with the Internet of Everything.